Residents of Downers Grove and DuPage County may dispose of Household Hazardous Waste (except latex paint) at the Regional Household Hazardous Waste collection site in Naperville at 156 Fort Hill Drive. The hours are Saturdays and Sundays (except holidays) from 9:00 a.m. to 2:00 p.m. For information about the site and accepted items, visit the City of Naperville HHW Collection Site webpage or contact Naperville’s Department of Public Works. The DuPage County Online Recycling Guide answers questions regarding household hazardous waste, how to safely dispose of these products, and how to recycle many other household items. For more information about hazardous waste disposal, please contact the DuPage County Hazardous Waste hotline. Visit the DuPage County Waste, Recycling and Green Initiatives webpage for information about special one-day collections of recycled materials, electronics or household hazardous waste at sites throughout the County. Latex paint can be dried with cat litter, oil absorbent, sawdust or another absorbent material. Once the paint is dried, it can be scooped out and disposed of with regular garbage. The can may be rinsed out and put with curbside recycling. Another method is to leave the lid off the can and allow the paint to dry out. The can and contents may be placed in your regular garbage. Kin-ko Ace Hardware, 6216 Main St, Downers Grove, (630) 968-4355, will accept latex paint for recycling. A small fee will be charged for the service; $2.50 per quart, $3.50 per gallon, $10.00 per 5 gallon bucket. The service is provided by Earth Paints Collection Systems. Kin-ko Ace Hardware, 6216 Main St, Downers Grove, (630) 968-4355 There is a recycling fee of 50 cents per bulb. Kin-ko Ace Hardware, 8625 Woodward Ave., Woodridge, (630) 985-0023 There is a recycling fee of 50 cents per bulb. The Village accepts used motor oil and transmission fluid which will be used to heat the fleet services garage during the winter months. This program is not for use by commercial entities. Items may be brought to the Fleet Services garage, Monday-Friday, from 7:00 a.m. to 3:00 p.m. The garage is located within the fenced parking lot off Curtiss Street, on the east end of the Village Hall complex. 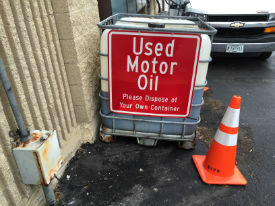 Used motor oil must be poured into the large receptacle located on the south side of the garage, labeled USED MOTOR OIL. Please take empty containers with you to reuse as these are not recyclable. For locations that accept used cooking oil, visit SCARCE. Unused prescription and over-the-counter drugs are accepted on weekends at the DuPage County Household Hazardous Waste collection site at the Naperville Public Works, 156 Fort Hill Dr., Naperville, IL 60540, (630) 420-6095. The Downers Grove Police Department has a container for disposal of home sharps located in their lobby at 825 Burlington Ave. In addition to business hours, the container is also accessible after hours. The Downers Grove Park District accepts rechargable batteries only, at the Recreation Center, 4500 Belmont Rd.